Just look at how incredible Wolverine looks, he is ugly, he is angry, he is vicious. He lunges forward with his wounds bleeding, his clothes ragged, as a bloodied and bruised husk. He insights fear and terror which is exactly what Wolverine should do. His grit determination and sheer ferocity is so emphatic and firmly represents the reality of a war-torn man. There is a gruesome imperfection that Jock brings to his character, which is probably the most accurate reflection of the life he has led. Quite simply he is Savage. This look is not just for the action sequences, as the story moves into quite a familiar yet estranged grounds. 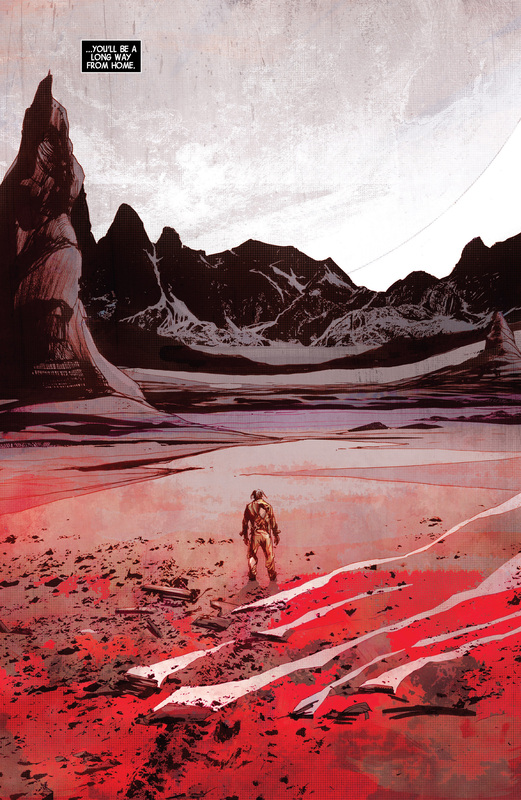 Wolverine is lost on a strange planet and comes across some evil science aggressors that have cloned him. They leave him a boy who seems to be the project’s only success. This is far from an original story, but what Jock does well is that he essentially removes the plot from the comic. It is the artwork that is important, which is why this arc is simply engrossing and a joy to behold. Almost every fathomable Wolverine story has already been written, so let us extract from a classical one, but draw it better than many before. The scenes between Wolverine and son are quite subtle because there is minimal physical contact but Logan’s paternal instincts play an important role. He minds over the child and guides him through the difficult decisions he once had to make. Narratively speaking he is as much his kid as X-23 or Daken. 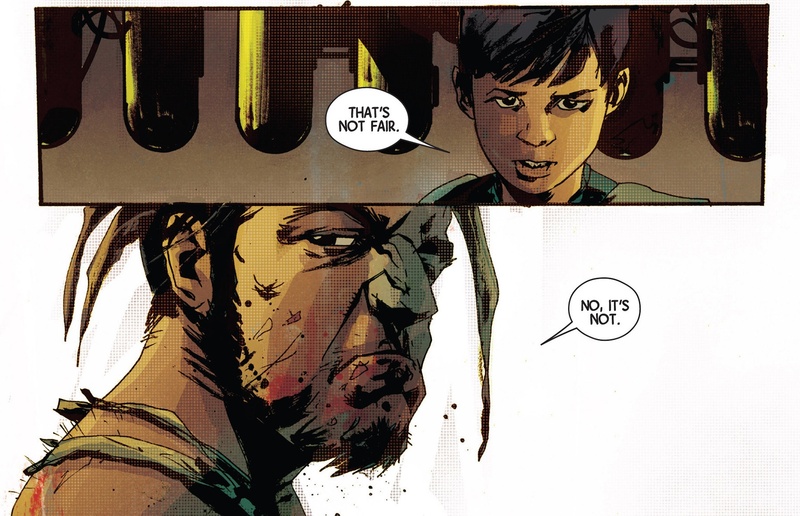 The tough lesson delivered in the following panel leaves the young lad defiant and his father stubborn. Their facial expression say all that need to be said. There is a wonderful contrast between the youthful naïveté of the boy and the rugged visage of his clone father. Their misadventures continue and Jock employs an intriguing tactic of minimalist backgrounds in much of his work. The only work where the void is filled are those of a scenic variety, where Loughridge’s colouring really comes into its own. The skies, winds and grounds are alive with movement as the shading sways along with nature. 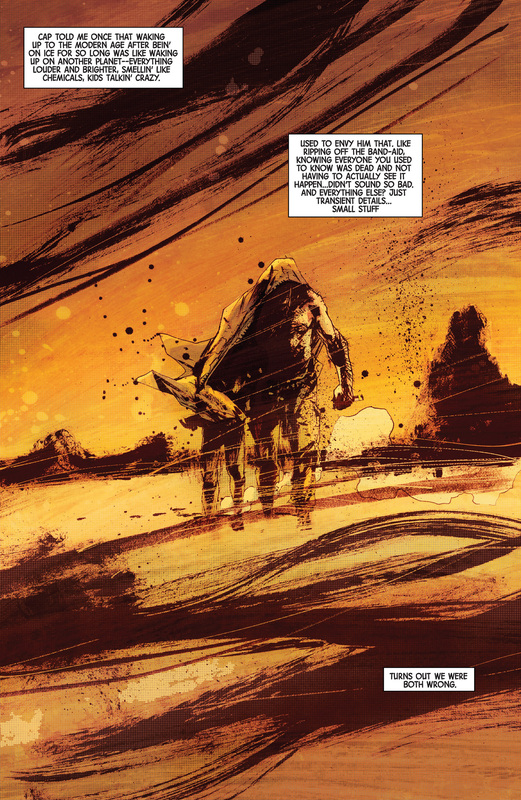 This panel shows the predicament Wolverine is in, as he is desolate in a strange and colourful world, certainly not his own. The mountains look rough and dangerous and the outlook is bleak to say the least. Jock is not afraid to leave a space empty and uses it to his advantage, especially when juxtaposing it to a landscape as shown. However when Jock takes his characters indoors or fighting, he keeps the focus firmly in the centre of the page. It is almost as if he does not want your gaze to move astray. 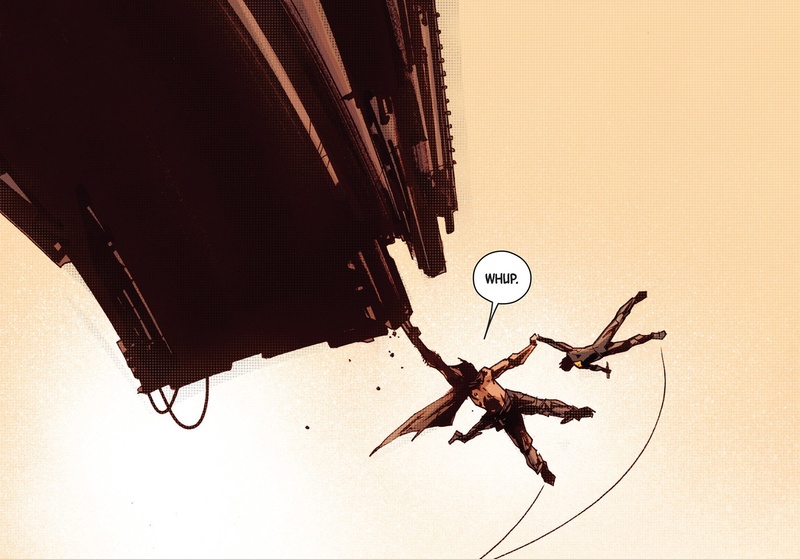 The following panel is similar and utilises this tactic in order to emphasise the ridiculousness of Wolverine’s stunt to grab hold of the ship, with child in tow. The sparseness of the sky plays a suitable backdrop to the stretching silhouette of our protagonists. It adds a level of danger and the single motion line brings about the swinging motion necessitated. You will notice this trait in other Jock books, including Snapshot and Batman. I have digressed far enough because what we really want to see is Wolverine doing what he does best. This following panel is horrific, because he digs his claws into the body of a guard and essentially lets rip. The panel movement with the claws stretching has a vibrant motion as the blood and organs of his victim spray outward. Jock keeps the shading deep to allow our imagination to take part in the scene, which almost makes it more disgusting. Once again the simplicity of the background keeps the focus on the savageness ahead. These traits makes Jock a fantastic candidate for a feral Wolverine artist, he is able to show a regretful but angry man who is simply trying to survive, whilst protecting an innocent child. Strip away the unnecessary plot and the detailed backdrops and you are left with pure rage and emotion on display. Jock captures the essence of Logan in these three issues, whilst many a creator spends hours trying to bring a new look Wolverine. 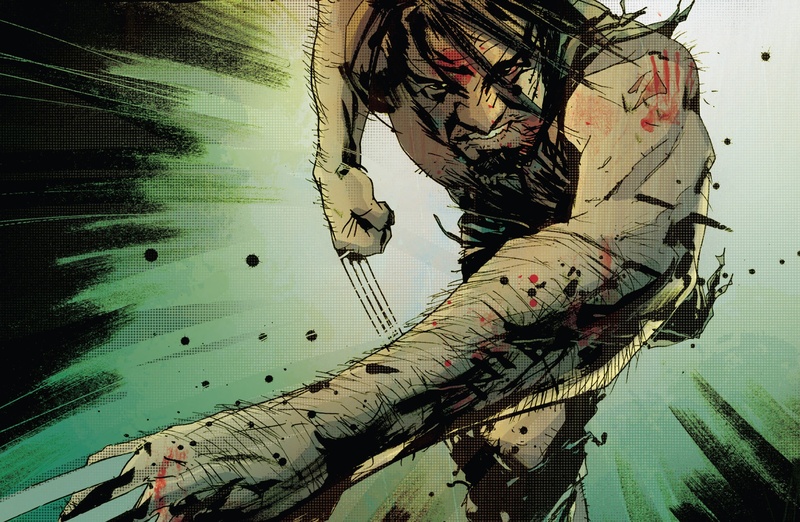 You can spend days conjuring new villains or complex plots but Wolverine will always do what Wolverine does: He will slash his way out of hell. And he has literally done that over the last few years too. 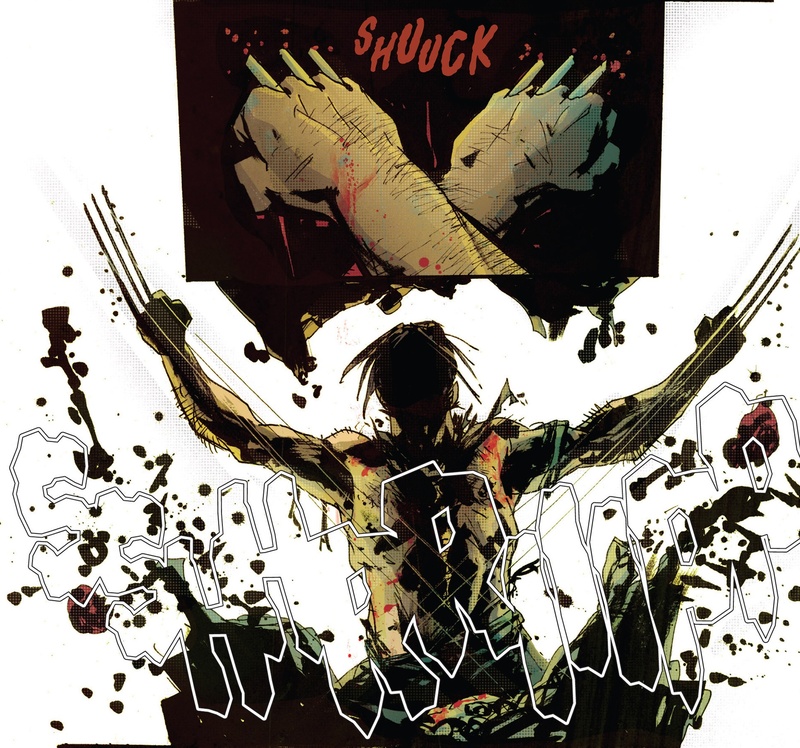 Jock takes Logan as he is, a tortured lonely monster capable of love and directs our attention to these simple truths, deconstructed but unabated. I shall leave you with perhaps my favourite page of all, cold and turbulent but heart-warming at the same time. Wolverine artistry at its best.